We have had a very productive week around the homestead. Throughout the winter we occasionally get days that are 45+F and sunny. These are good opportunities for us to work on projects outdoors while we can, and we take advantage of them as much as possible. We had one this week and were able to get some things done. 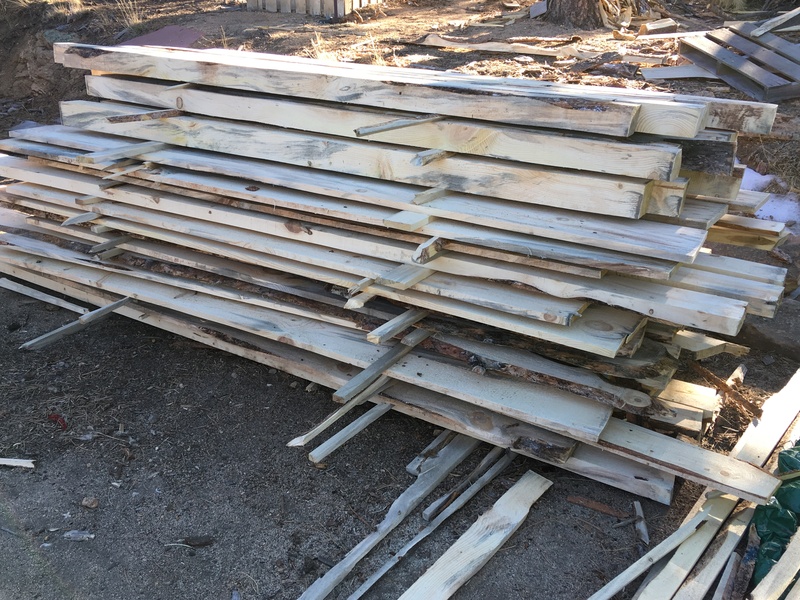 Our lumber was finished early, so we picked it up and used it on the projects. 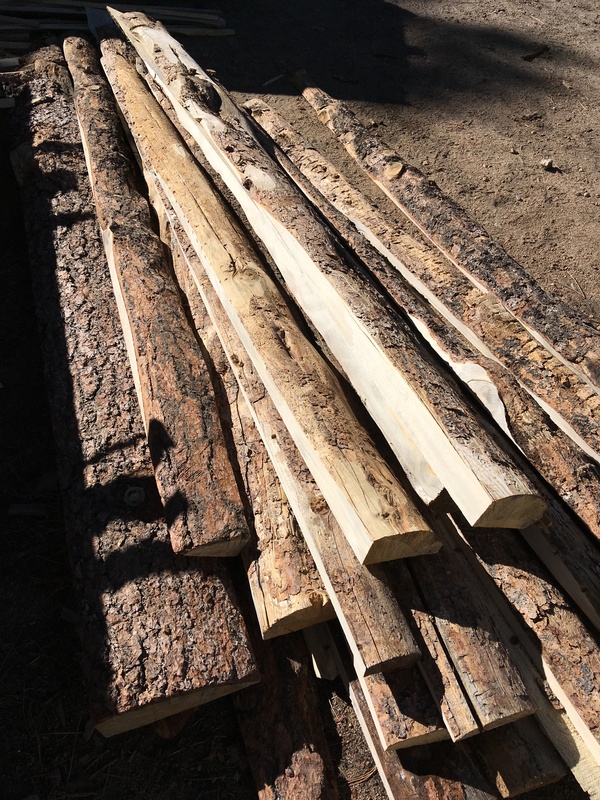 This lumber is from several trees we had to cut down last year and we took it to the local mill to have it made into 4×4, 2×6, and 1x lumber. 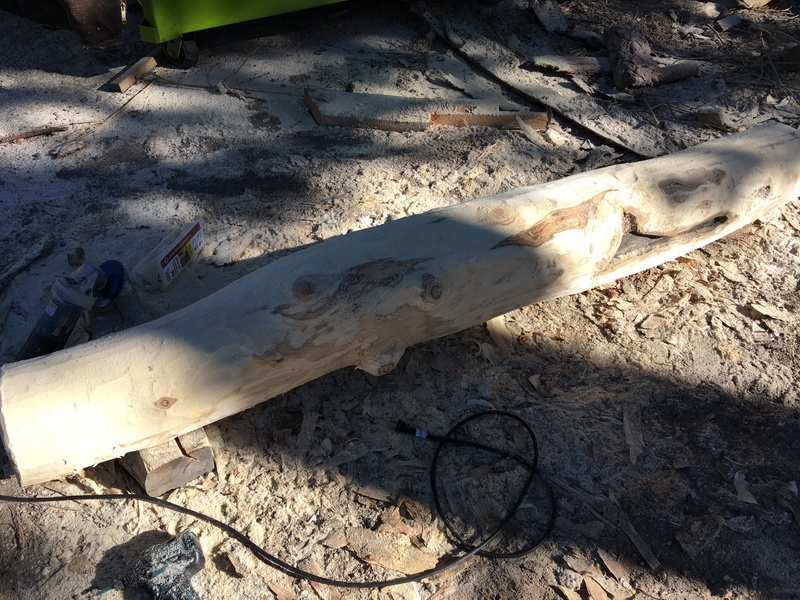 …that needs to be stripped and sanded so it can become our mantle. Mtn Man and I ripped logs, with Little Miss helping gather the wood scraps for the kindling pile, and Mr. Smiles in his stroller watching us all. 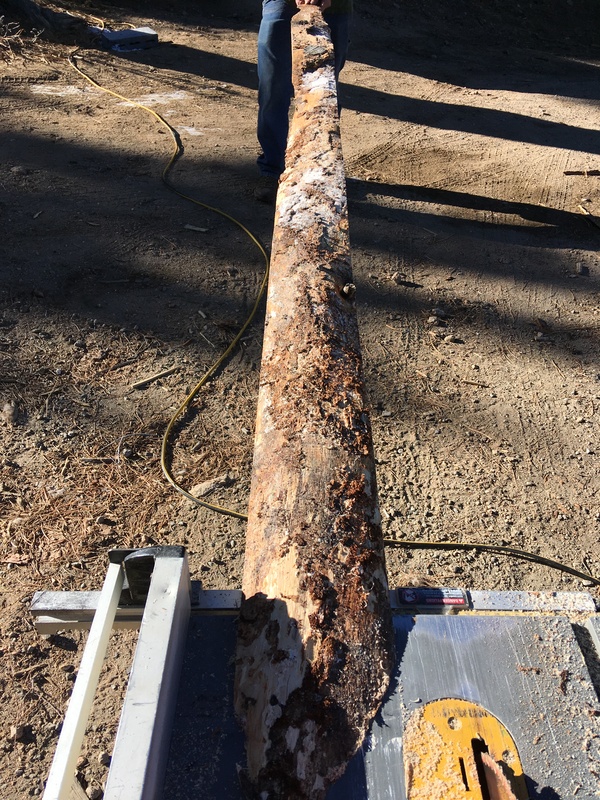 The bark slabs from the outside of the trees are cut off as they make it into lumber. 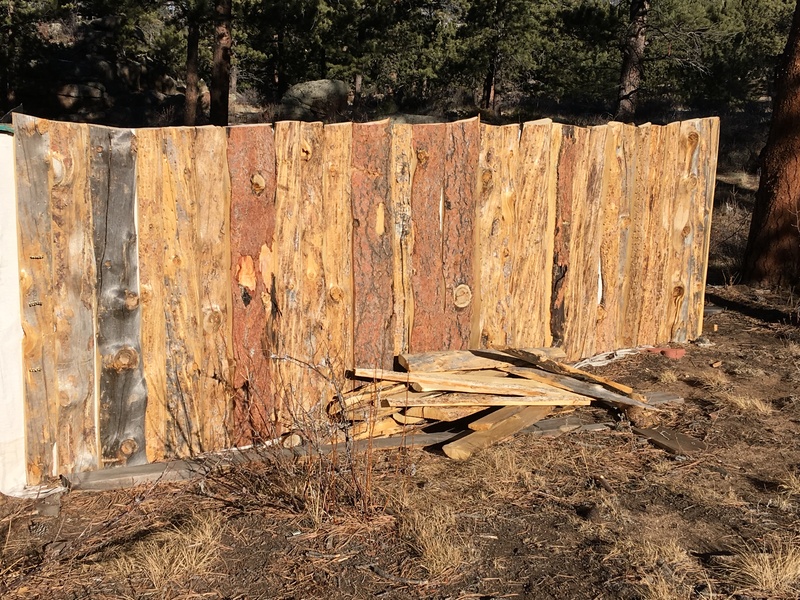 We find these slabs very useful for our version of a privacy fence – a Rocky Mountain solid fence. The slabs are all different widths and have uneven edges. We run them through the table saw to get the edges mostly even so they fit nicely together. It is not a perfectionist thing…we want it to have some character, but still fit pretty well. Depending on the fence, we are more particular or less particular. 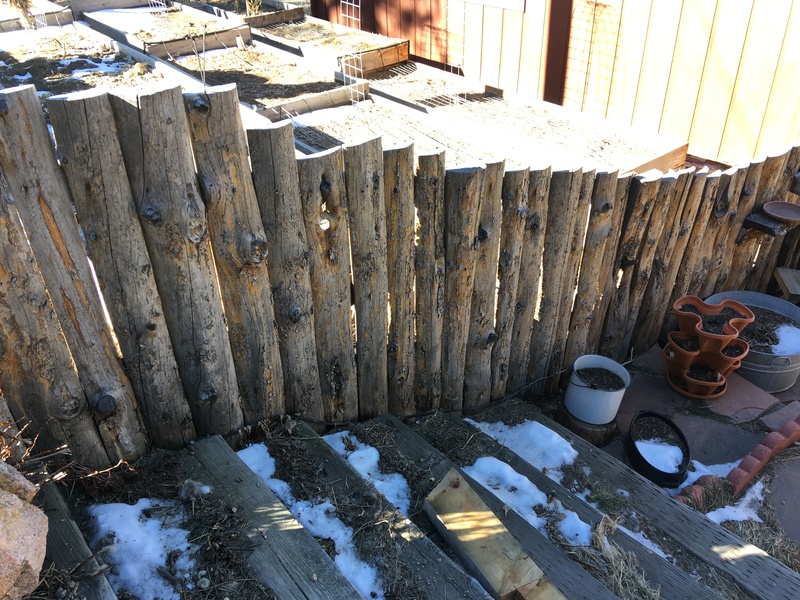 We used it to build the 3 foot garden fence many years ago. But this week we were using it to attach to a section of the barnyard fence. We first hooked up a big canvas tarp along the fence, and then put the slabs over it. This will make for a nice windbreak for the upper corner of the barnyard. 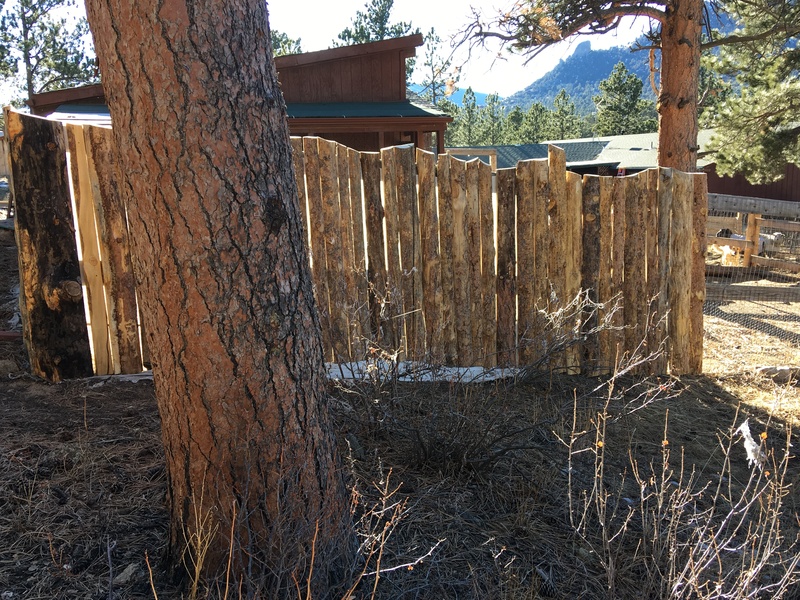 Most of our fencing is not solid, but when we do want some that is I really like this look because it blends in with the area well. I don’t like buildings and fences in the woods that stand out from everything. We started our incubation! 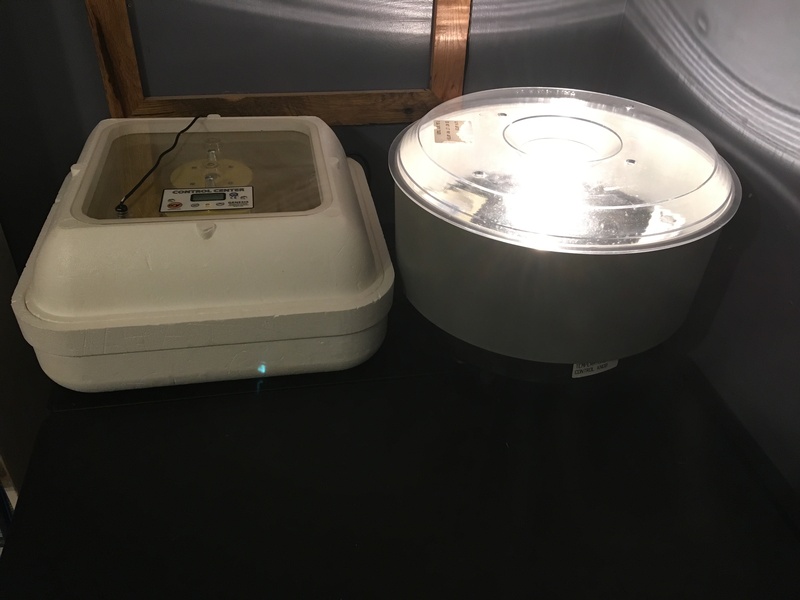 We are using both of our incubators this time because we wanted to set a large amount of eggs. Hatching at high-altitude is complicated, especially when the birds laying the eggs didn’t themselves hatch at high altitude. Although studies show that hens laying at high-altitude lay eggs with less pores to make up for some of the challenges caused by the altitude. But we have found that our first generation of birds always have very low hatch rates, and our hatch rates go up as we get into the next few generations of birds that have been selected and hatched at altitude themselves. 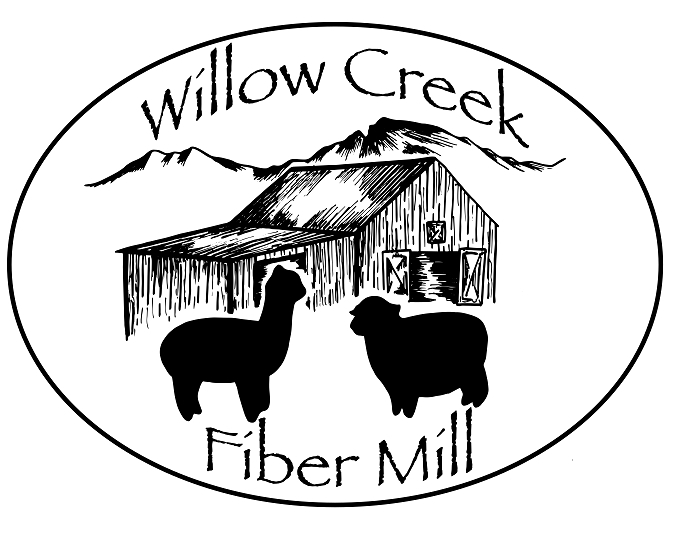 Because we had to cut our flock way back due to our son’s medical issues, we are now starting back at square one so-to-speak with our breeding and hatching program, so most of the breeding birds come from lower elevations and are our first generation. In the years to come our hatching success should increase with the second and third generations of high-altitude birds. Because of all that, we will likely have a low hatch rate. Thus we wanted to set as many eggs as possible to make up for the lower hatch rate. We were able to fit 75 eggs in the two incubators. We have a Hovabator 1588 and a Top Hatch TH130. We prefer the Hovabator, but they both perform pretty well. And when we want to set a lot of eggs it is nice to have them both. We will candle for fertility later this week and see how our roo is doing at his part of the job. 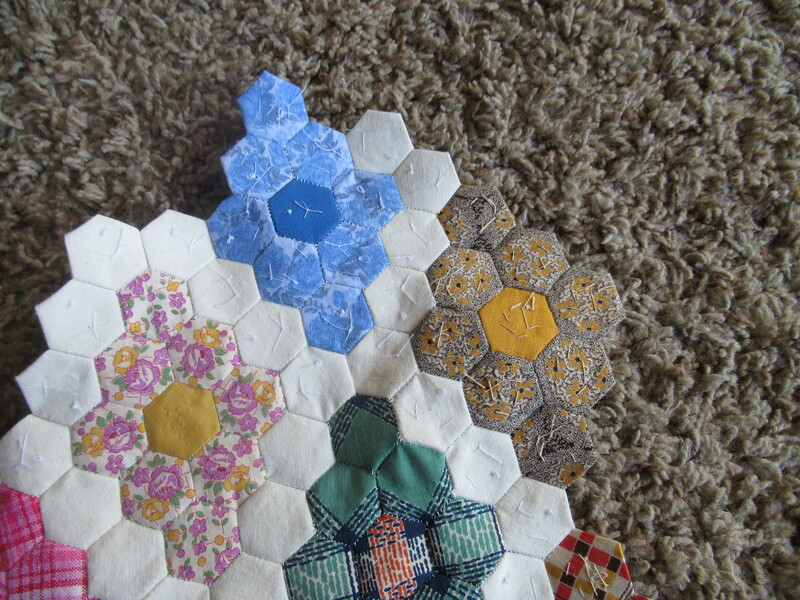 The EPP hexagon quilt has come out to be worked on again. 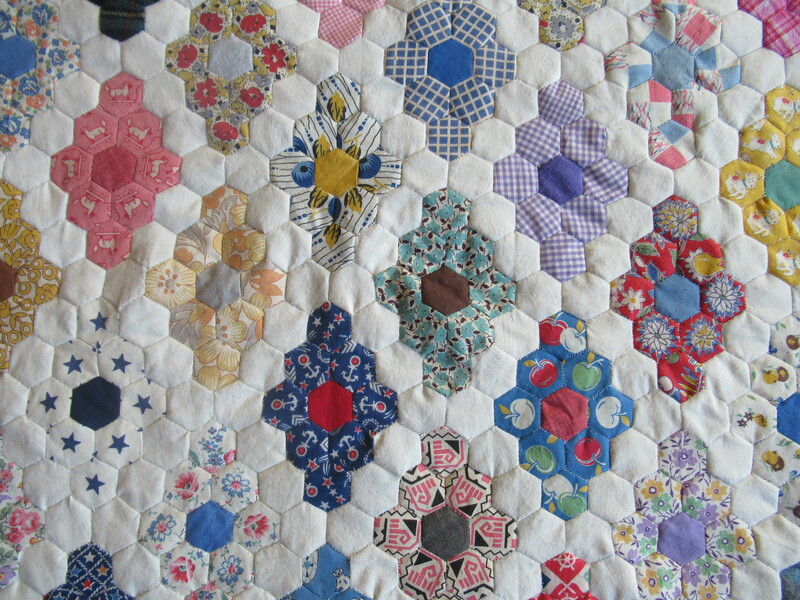 I talked about how special this quilt is and what it is about in this post last year. Because the pieces are so tiny, and it is completely hand stitched, the girls and I only work on it for a few weeks at a time and then put it away and bring it back out later. It has been almost a year since we worked on it though! How time flies around here. But Little Miss was in the mood for it so she dug it out and the two of us have started working on it again. We will see how much progress we make this time before our hands get tired of all that tiny stitching. As I posted last week, my grandmother taught me how to do hand-stitched English Paper piecing quilts when I was a teenager. 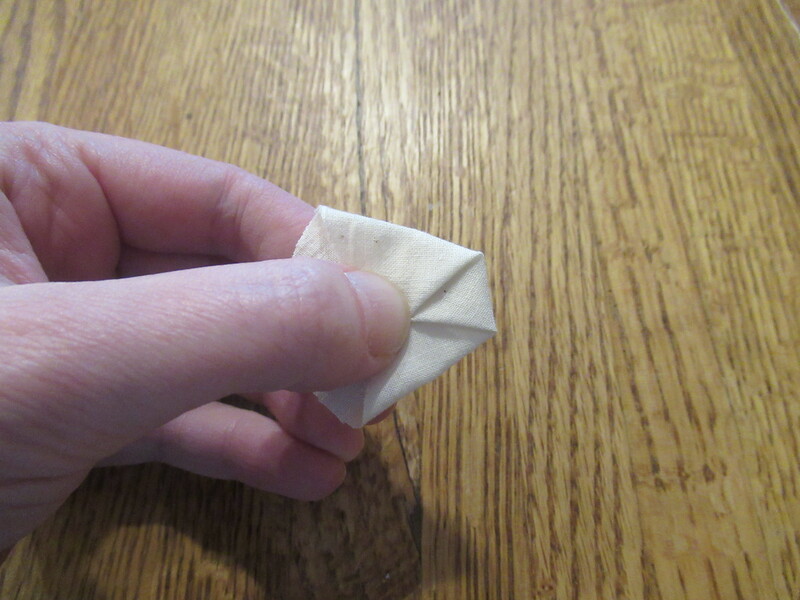 She shared with me a box of diamonds made from hexagons that she and my great-grandmother had made for years from clothing scrap fabric. 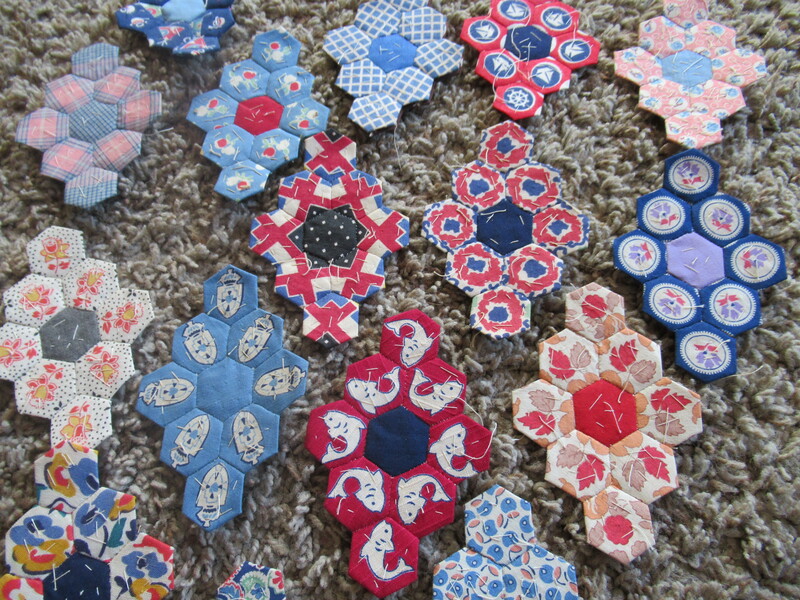 My daughters and I are now using those pieces, along with new ones we are making from our scrap fabric, to make a quilt. 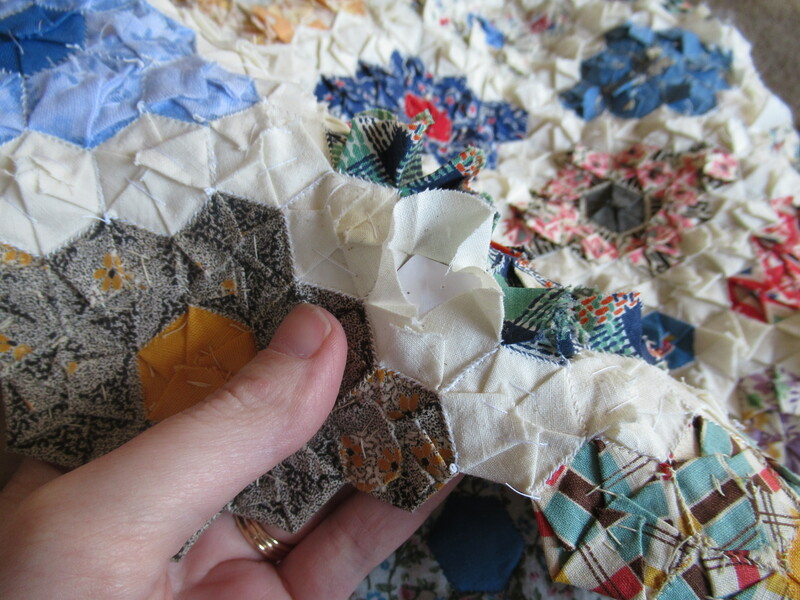 There are a few different ways to do paper piecing, I am sharing how I was taught by my grandmother, which is how she was taught by her mother. There are many different shapes you can use, and sizes of shapes. 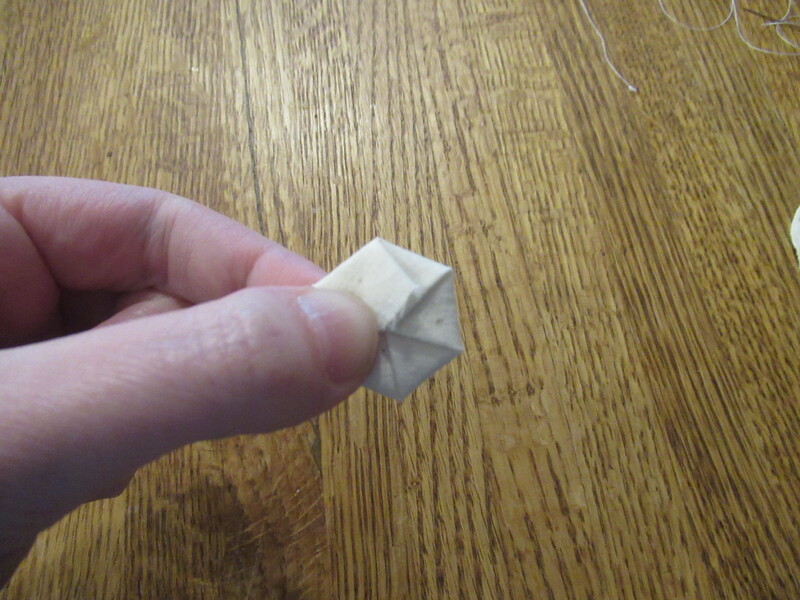 The hexagons we are making are very small – only an inch across. 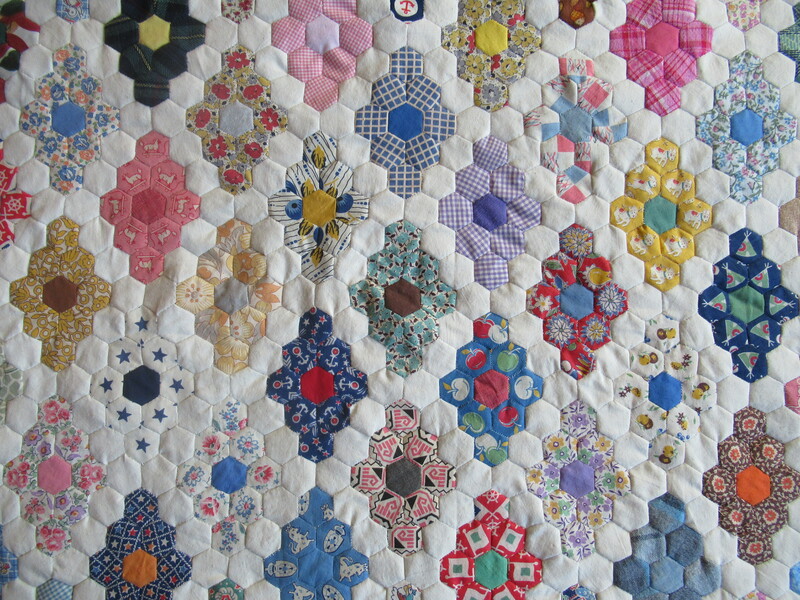 I would suggest starting with something bigger – while these look really great, it is quite a tedious and time-consuming project to complete a quilt made with tiny hexagons. 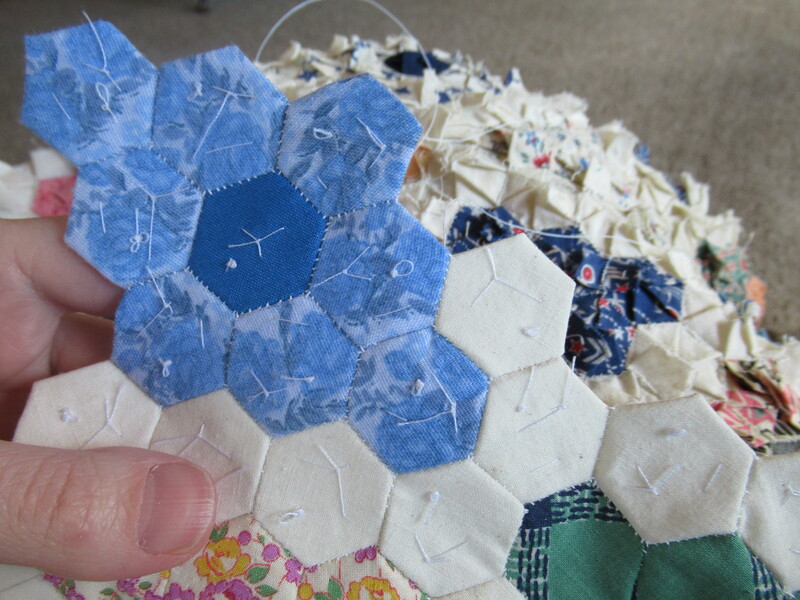 I have previously made a Christmas tree skirt with 4-inch hexagons and it was a much faster and easier project. 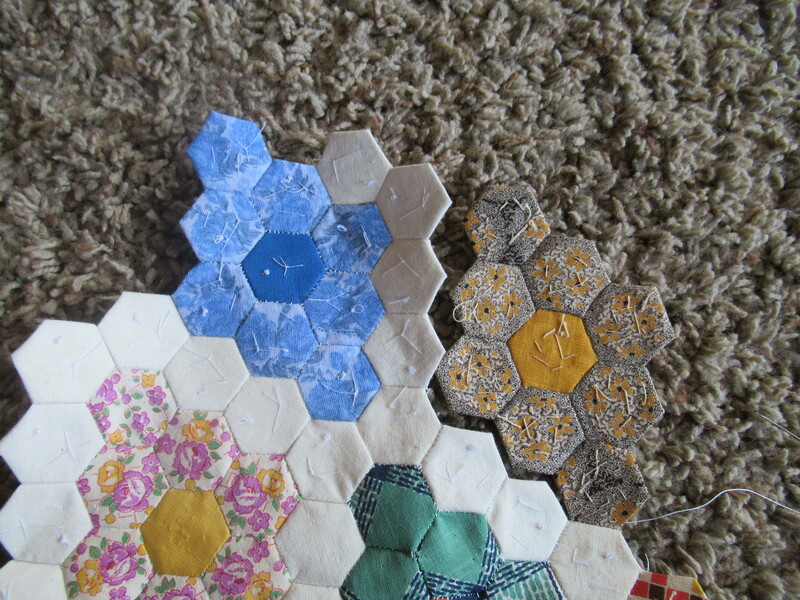 First, how to make the hexagons. 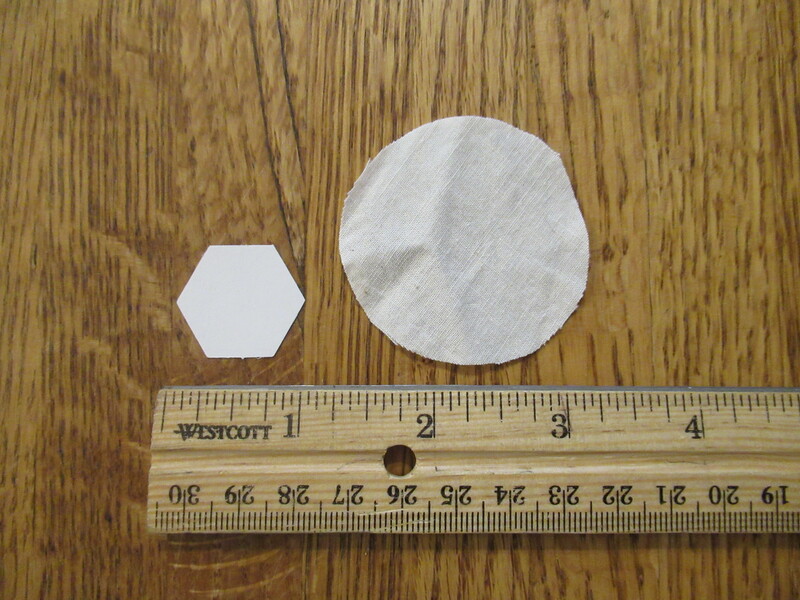 You will need hexagons made from sturdy paper, and fabric cut into circles big enough to wrap the hexagon in. 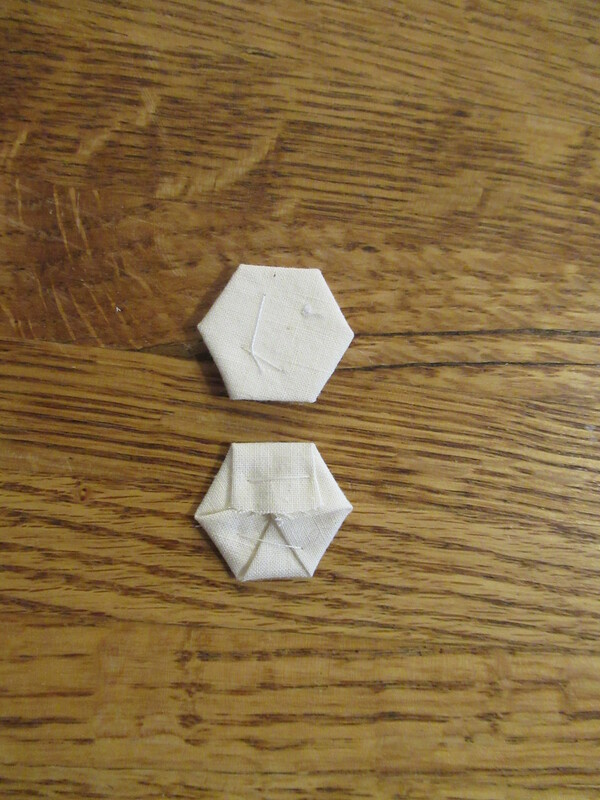 When my grandmother taught me, she was hand-cutting each paper hexagon using a cardboard pattern. 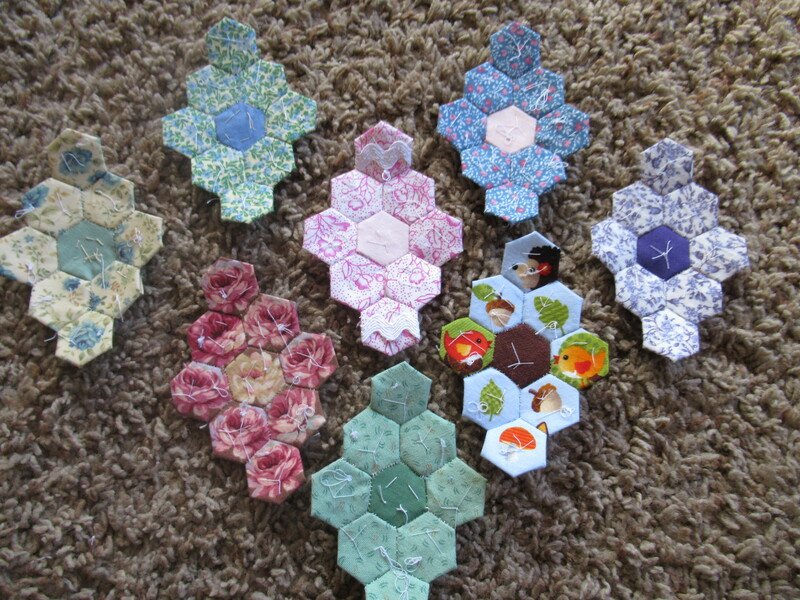 It was tedious and man it is tough to get a hexagon just exactly even! I was very excited when I found that you can get die-cut paper pieces online. 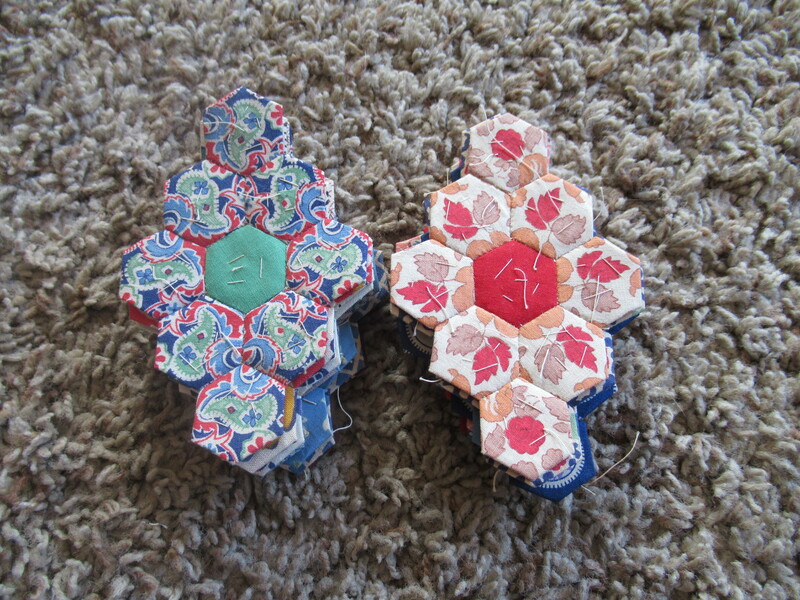 I happily bought a package of hexagons that are each the same and I don’t have to do any cutting. My personal favorite is the store Paper Pieces. 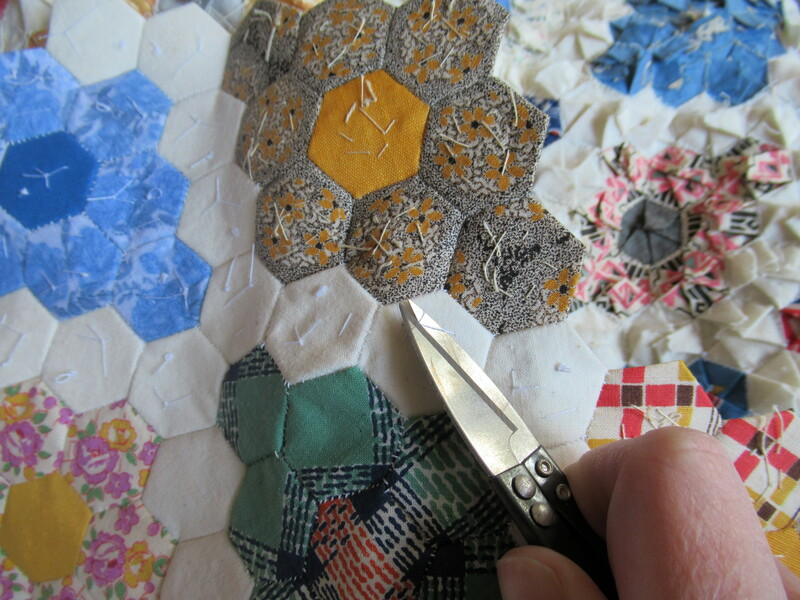 You take the fabric circle and carefully start wrapping it around the hexagon, one side at a time, being sure you are getting it tight along the straight edge and keeping the corners nice. 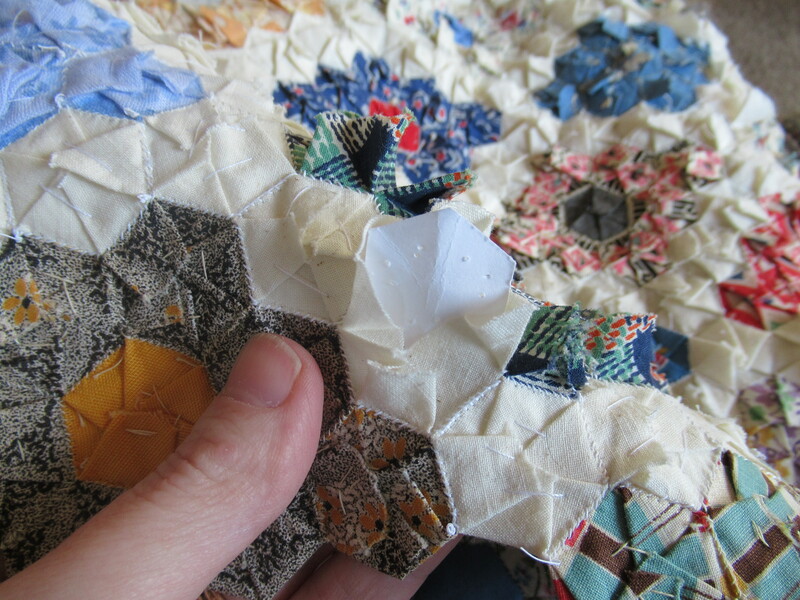 Then, using some cheap thread, you baste the fabric onto the paper hexagon with a few stitches. You want it held firmly, but you will remove these later so you want them big and easy to get out. 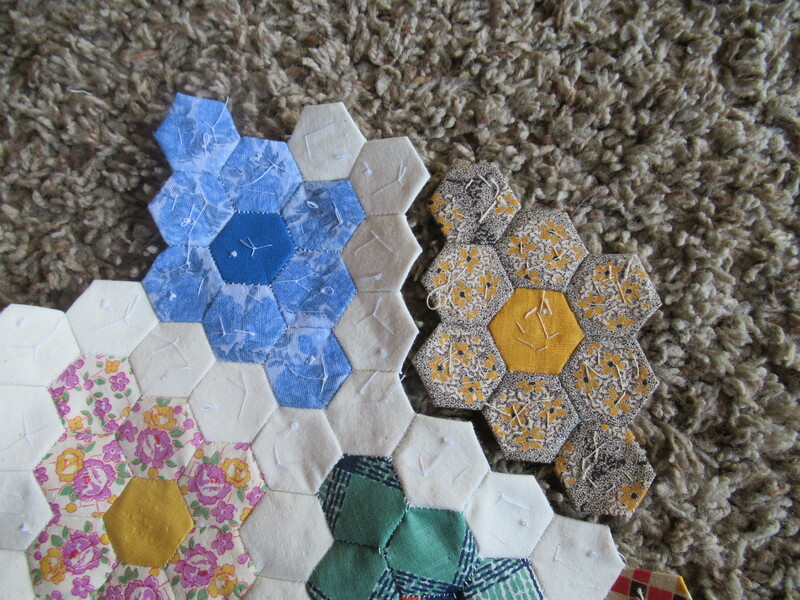 Now it is time to hook the hexagons together. You can obviously do this in any number of patterns using different fabrics etc. My grandmother and great-grandmother made diamonds out of 9 hexagons, making the center hexagon a solid complimenting color. 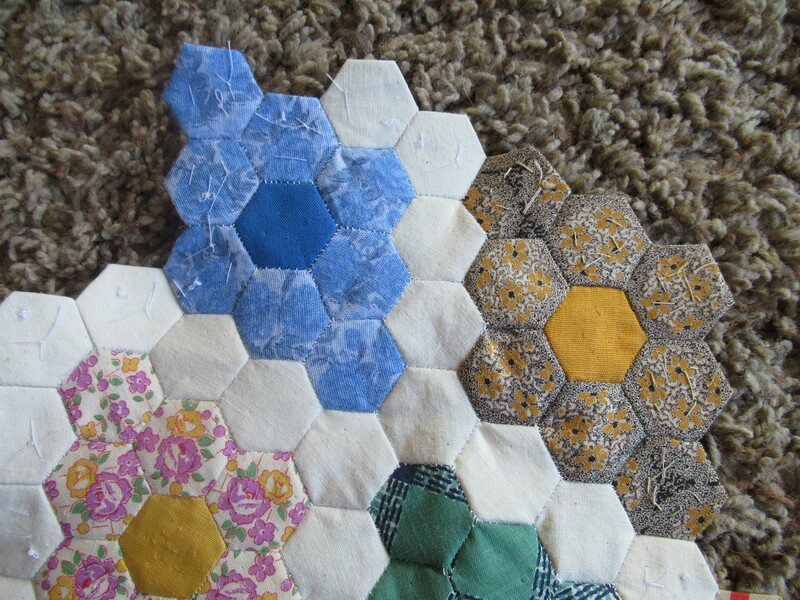 I decided to hook them together with white hexagons in between as a border for a simple vintage look. 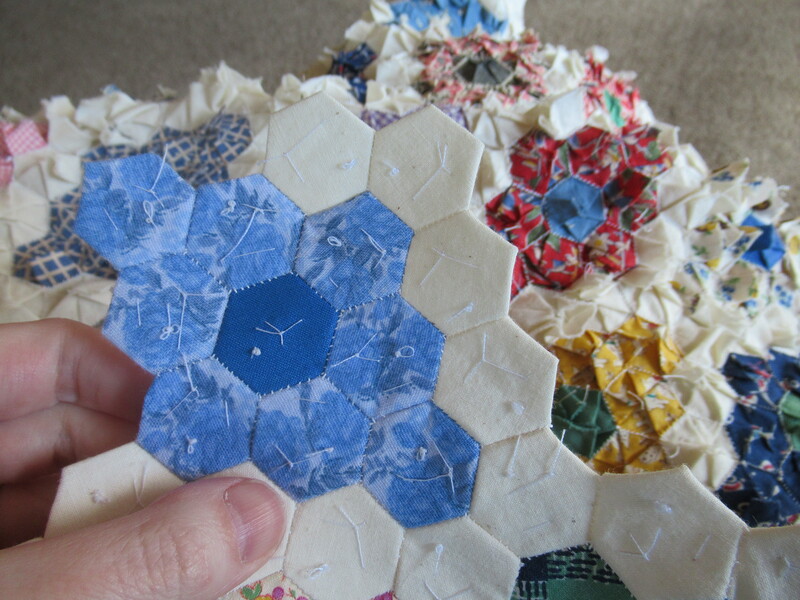 To hook them together, you place two hexagons right-sides together and whip stitch along the straight edge, being careful to grab a little of each fabric but not the paper that is inside of each piece. I occasionally grab a tiny bit of the paper, it is bound to happen, just try to not stitch to far onto the paper and not too often. When you are finished, do not tie off or cut your thread. As you see when you open it up one side is now attached. Turn the pieces right sides together with the next side that needs to be attached and continue your whip stitching along that side. Repeat for as many sides as need to be attached for that piece. 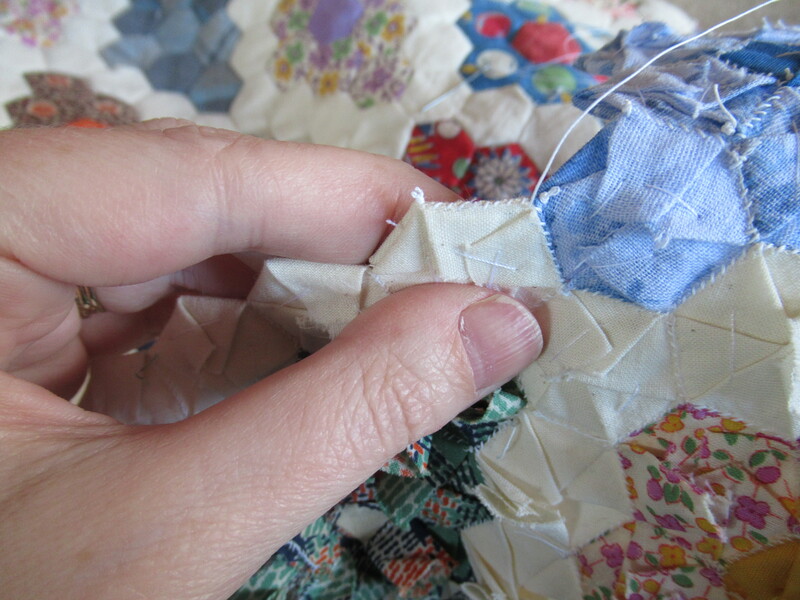 In this example I am attaching the white border pieces to my already in-process quilt. As you can see, I keep attaching white borders along the edge of the colorful diamond. Once they are in place I attach another diamond set. It is done like the single hexagons, one edge at a time, working my way around all the edges. 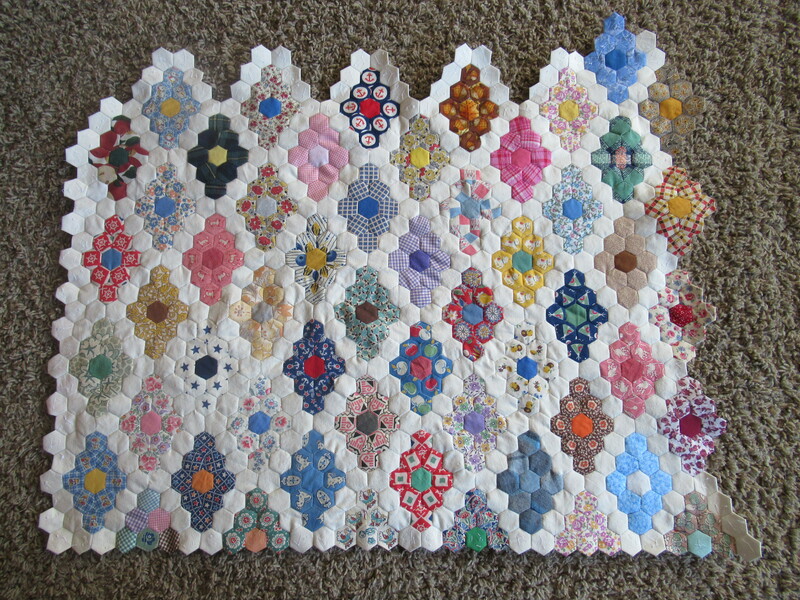 Then I add more white and so forth and so on, building the quilt up a little at a time. It is important not to remove any of the paper until a piece is sewn on all edges, because the paper holds the shape for you. As you can see here, I have removed all the basting stitches and paper from all the interior pieces, but the border pieces that are not surrounded fully yet still have their basting stitches and papers. 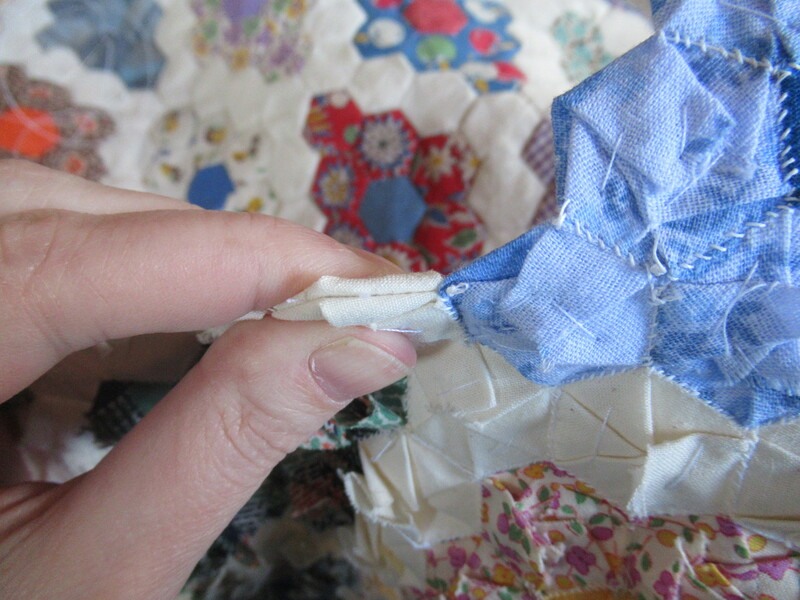 To remove the paper you just clip the basting stitches, turn to the back, gently open the fabric and pull out the piece. Some methods of putting the fabric on the paper leaves a lot less fabric on the back than this method. However, I am trying to copy the method used to make all the diamonds, so I am doing it this way. I think it will add some nice bulk to the quilt and make it warmer too. 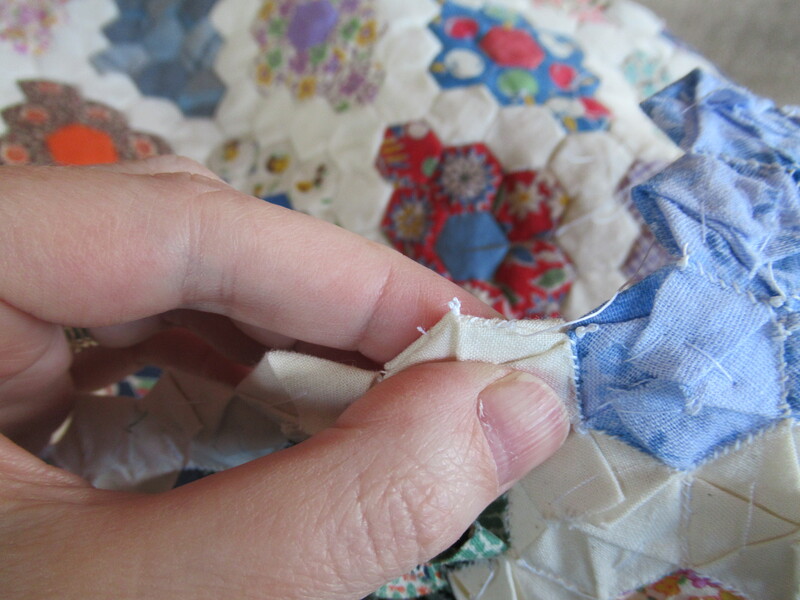 That’s all there is to it -the basics of how to do hand-stitched English Paper Piecing Quilts. I find them very enjoyable, and I love that they are a craft that is mobile – in that I can take it places to work on it or work on it in a recliner, as opposed to being at a sewing machine. Try it out yourself! 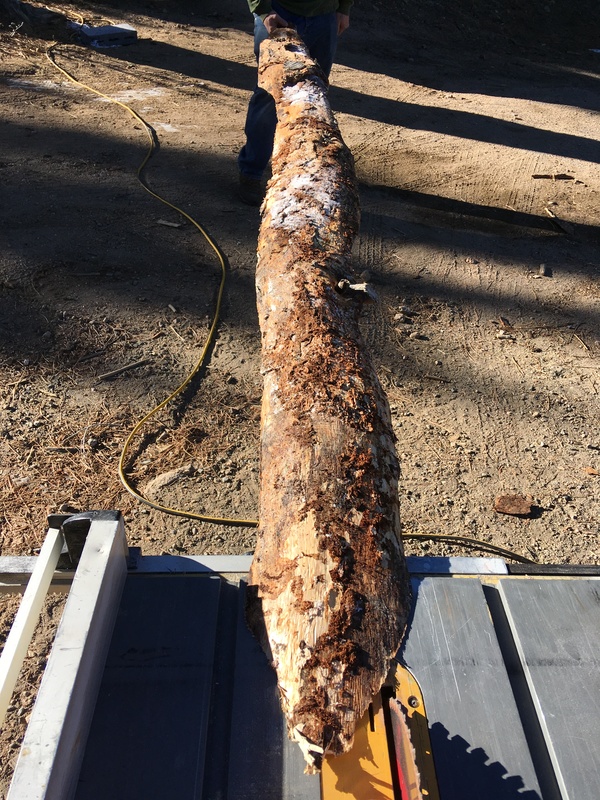 We have been doing some pretty typical mid-winter activities lately, and some not-so-typical as well. We placed our garden seed order, which is a very exciting part of winter around here. 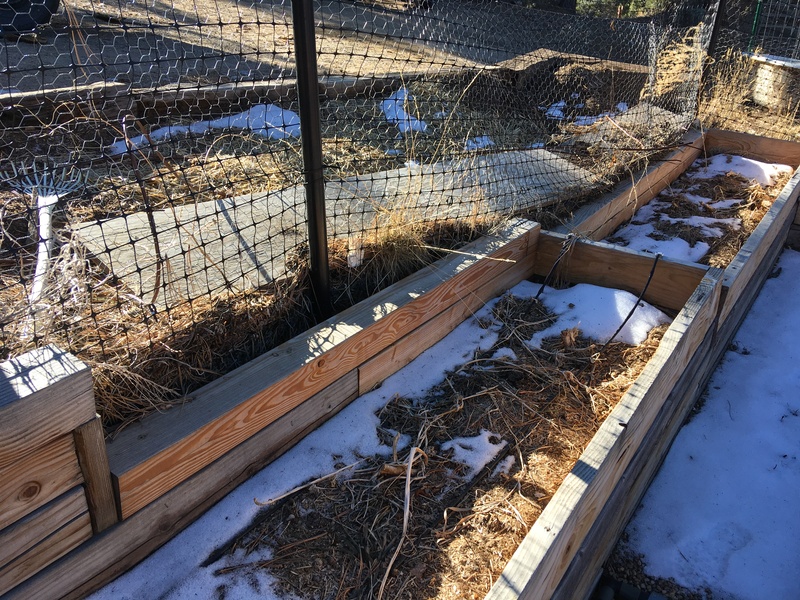 We have ordered exclusively from Seeds Trust the last few years because they have heirloom varieties that are specifically bred to do well at high altitude in the Rockies. We have had great success with them. Because we save our own seeds as well the order isn’t typically very big. This year is our biggest order in awhile because I didn’t save as many seeds last year. The planning for a garden is such a hope-filled activity. Dreaming of what could be this year….I love it! We also decided to order some chicks! 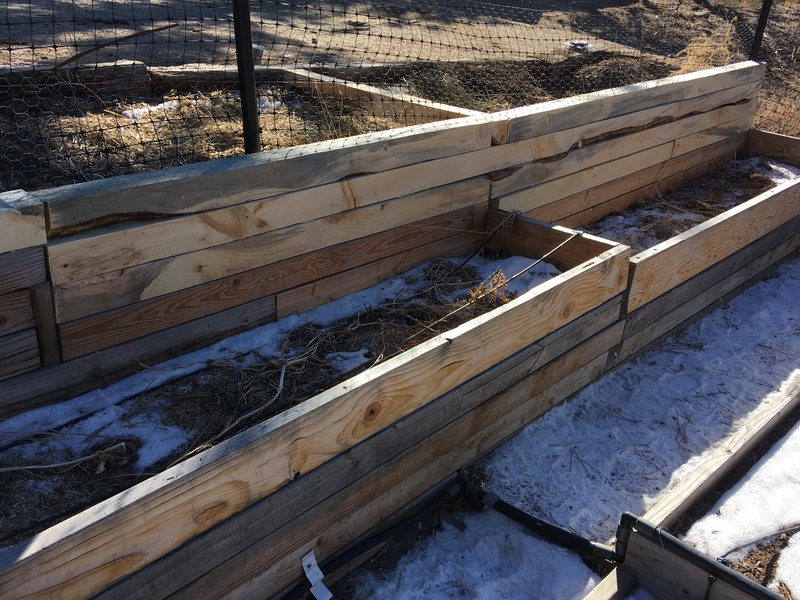 As you know, we have had to temporarily down-size our farm because of our 2-year-old’s ongoing serious health issues. So we are currently only raising chickens. 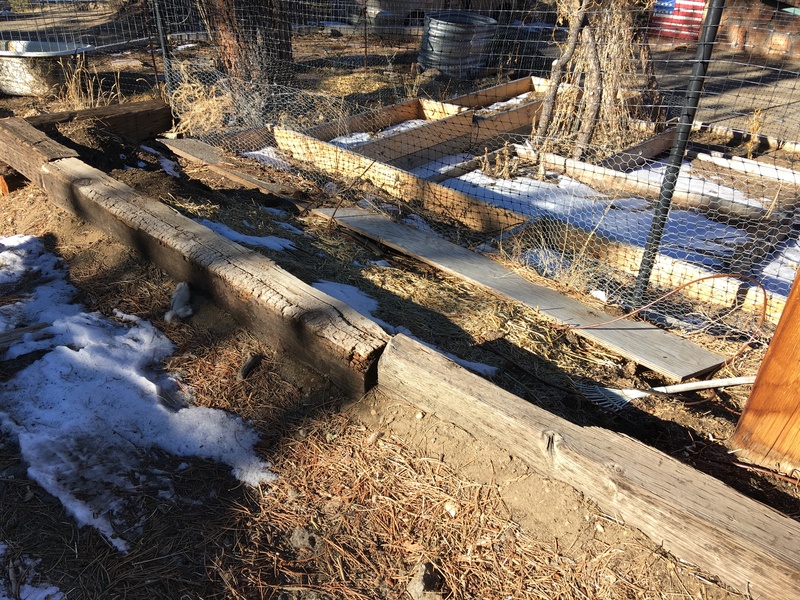 And the older kids took over the care of the barn and barnyard (chickens, LGD, and barn cats) to free up Mtn Man and I since we are often gone to specialists and hospitals hours away. Because they have totally taken over the care of the chickens, I thought it only right that they could decide what to do with them this year as far as production, breeding, selling, etc. They are already selling the extra eggs we don’t use. So they all discussed it and decided that just because we had to downsize doesn’t mean we shouldn’t continue being as productive as possible towards feeding ourselves from our farm, which is the main goal of our homestead – to feed our family as much as we can from our little plot of land. They discussed different breeding options, incubating vs. broody hens, buying chicks, etc. They decided that they will let any broody hen hatch that wants to. Those chicks will be used for meat, and replacement laying hens. But since they are only using broodies and not the incubator, that wouldn’t be very much meat (maybe 15-20 birds depending on how many sets the hens are willing to do), so then they decided it was high-time we tried meat birds. We have discussed it every year but never get around to it. So they have ordered 40 Red Ranger Broilers. They discussed potentially getting frankenbirds (Cornish cross), but decided they wanted to be more natural than that and didn’t want to deal with the health issues involved with those. The Red Rangers are able to free range and are at butcher weight by 9-11 weeks. Then they decided that since they will be brooding chicks anyway, they wanted to add some Silkies to the mix because we only have one and she is our best broody hen. They want more broody hens, so they added a straight run of 10 Silkies to the order, hoping to get 5 or so more silky hens, of which hopefully 3 will be good broody girls. We are looking forward to having chicks arrive in March! 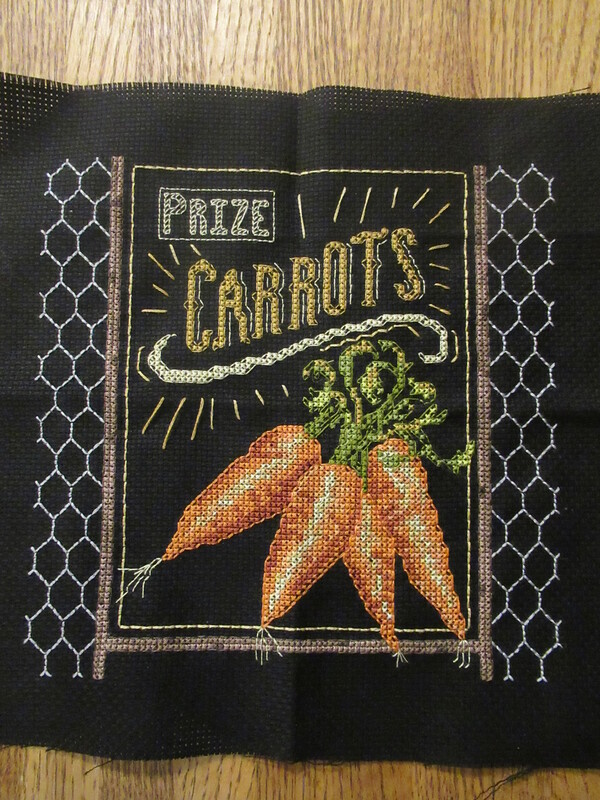 The pattern said “Market Carrots” but I changed it to “Prize Carrots” to commemorate the fact that Sunshine and I grew the first and second place carrots in our entire county fair. 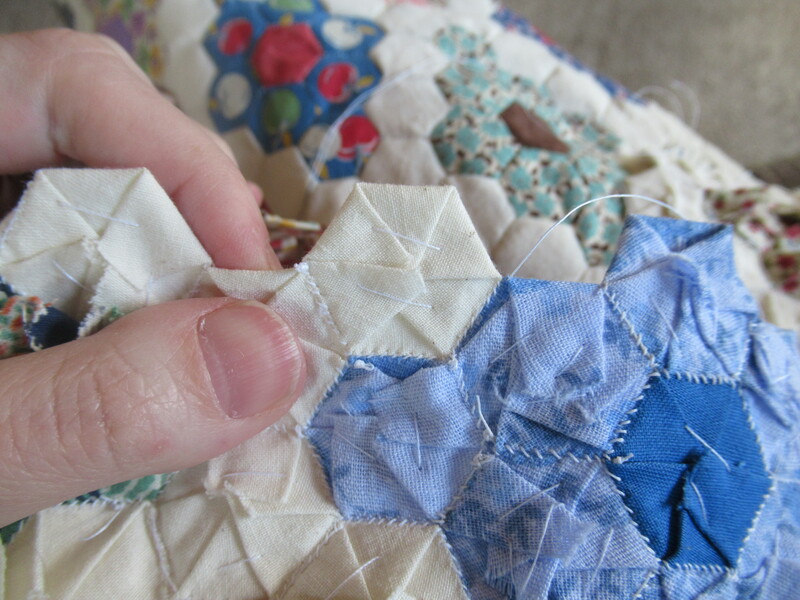 We have also been working on the English Paper Piecing quilt. 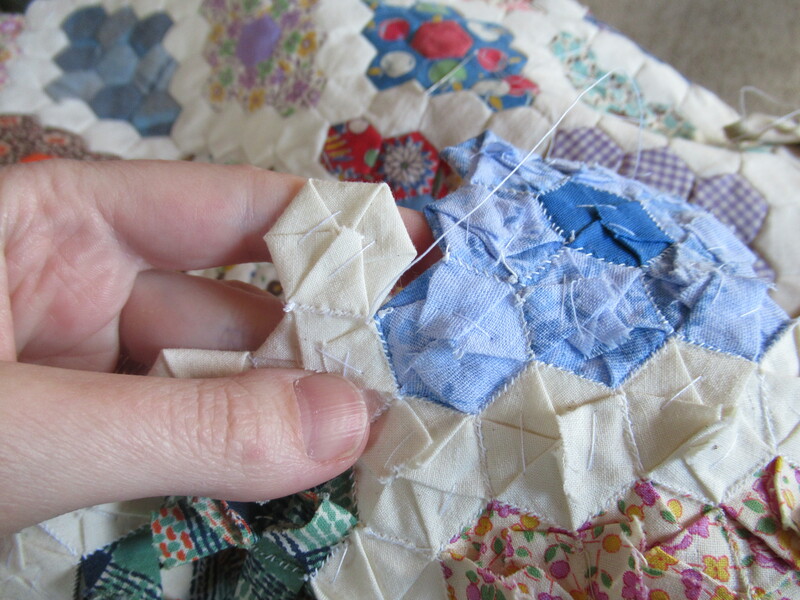 I will be sharing more about how to do English Paper Piecing later this week. 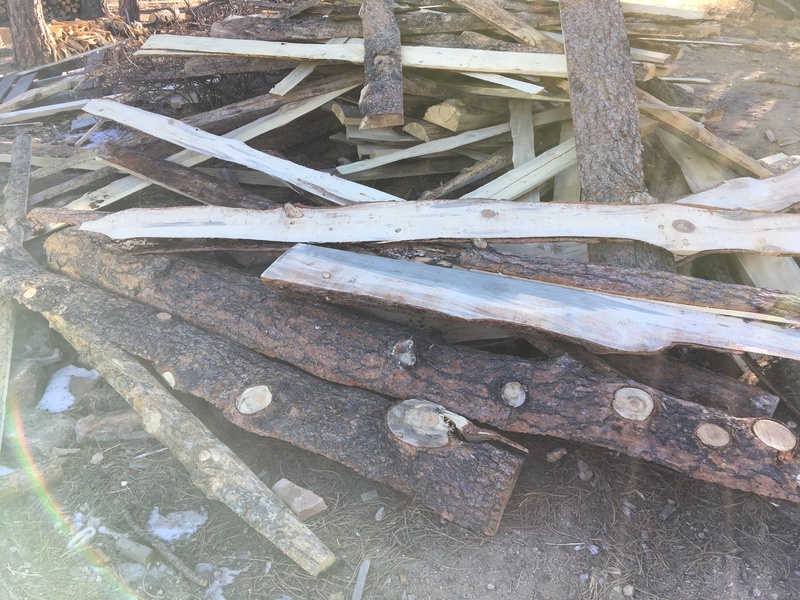 We normally do our wood gathering, splitting, and stacking in the fall. But this fall was all catiwompus around here, so nothing normal seemed to get done. 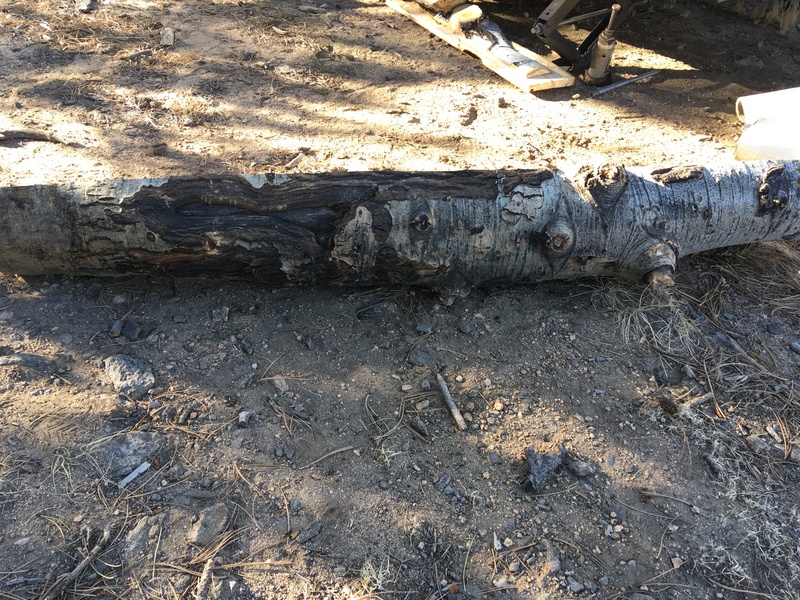 This means that we are splitting wood and stacking it several times throughout the winter to be able to keep our house warm. 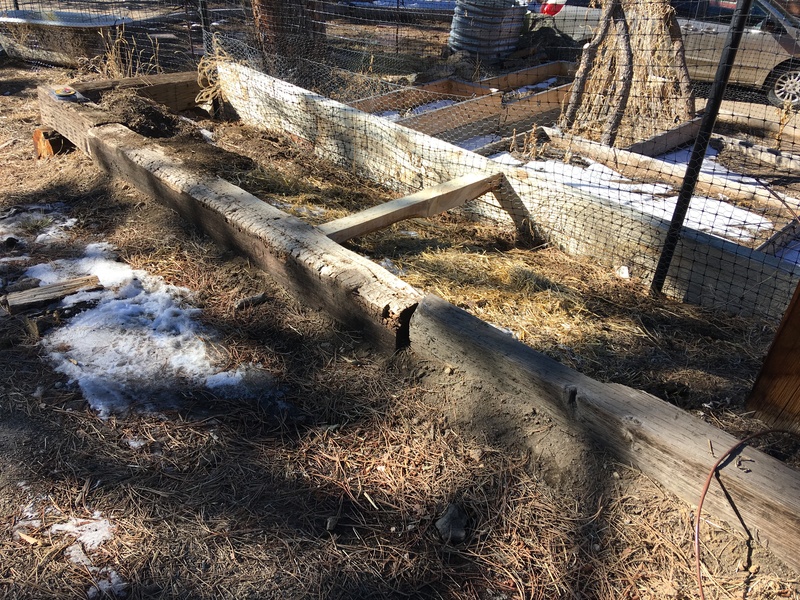 Thankfully, we have had a mild winter so far, which means that #1 we are not going through as much wood, and #2 it is nicer weather for stacking and splitting. This last week we saw that a snow storm was inbound so we spent time getting ready for it. 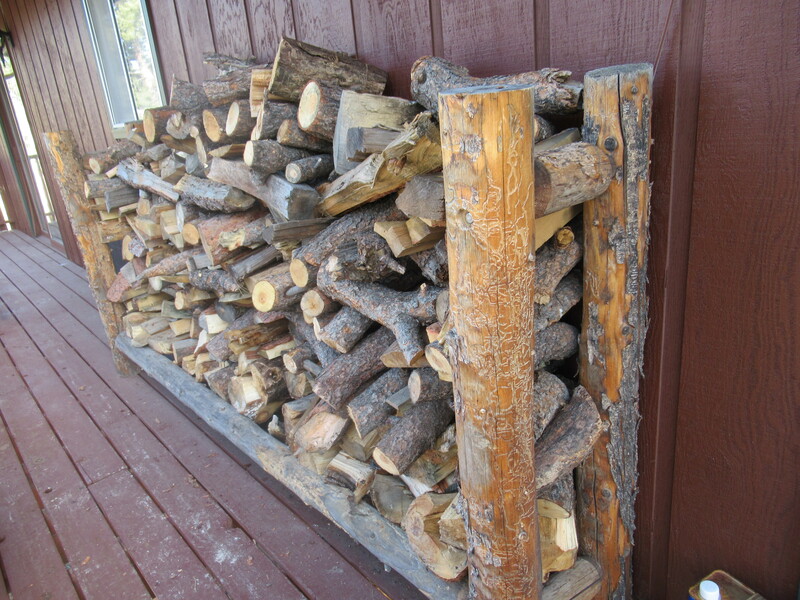 This is the wood rack for ONE of our two woodstoves. That should last us a few weeks. Feels good to have it all filled up.